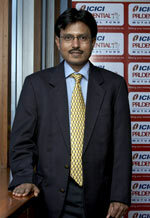 Nilesh Shah, Deputy Managing Director, ICICI Prudential Asset Management, talks about the future of the equity market and its impact on investors. What is your current take on the Indian equity markets? Currently, valuations are neither cheap nor fair.We have divided the market into various hypothetical buckets— cheap, attractive, fair, fair value plus, stretched, expensive and bubble. Markets were cheap between October 2008 and March 2009, became attractive from April to May 2009—this is when investors should have turned overweight in equities. Now the markets have crossed the first three stages and are hovering between fair and fair value plus. This is the time to be neutral in equity. So, if you wanted an allocation of 50:50 in debt and equity, go only for 50% in equities. If the markets keep rising, it may be wise to book some profit and move to debt. We expect the Sensex earnings to be about Rs 1,100 per share for FY11. At these earnings, the market is trading at 16-17x earnings (17,000/1,100). It could increase depending on the budget and the monsoon. If this happens and the earnings reach Rs 1,200, the market will get support; if not, it will face pressure. What are the support factors for the growth of the Indian economy and, hence, for Indian equities? First, we generate 30-35% savings, which are converted to investment and lead to a growth of 4-5%. If this is supported by foreign capital, it can be increased to 6% or 8%, depending on how much money we can attract and how well it is deployed in investments. Second, our productivity must go up. With more Indians becoming literate and imbibing global technology, and better infrastructure being created, the productivity levels are increasing. This will lead to better growth—taxation revenues will go up, fiscal deficit will be contained, corporate earnings will improve, employment opportunities and consumer demand will increase and industrial supply will grow. India’s path is the same as that followed by Japan from the 1960s to the 1990s, by the South East Asian countries, or by China today. If we grow at 8-9%, all our problems will recede, but if the savings are not converted to investment and productivity is restricted, the growth rate will be down to 2-3%, no jobs will be created and demand will be muted. We are taking all the right steps, so one should remain long in Indian equities. Is the worst over for the global economy and India? Unlike in 1929, central bankers around the world have moved at great speed with massive amounts, keeping consumer confidence and liquidity high. Unlike the last time, when the recession led to 10-15% of the workforce being fired, there has only been a 10-15% salary cut now. Unemployment numbers are a lag indicator and will improve once the economy revives. India has seen two major crises in the past 10 years—the 1997 Asian crisis and the 2008 financial crisis. During both these periods, India grew by 6%, which is good. What is your view on interest rates? How should investors play the cycle? Interest rates are gradually rising because inflation is expected to move up and because of the large size of the government’s borrowing programme. The market has already priced in the fact that these are known risks. However, if growth returns and government borrowing slows, interest rates are not going to overshoot the current levels—there will be a cap. So investors can stick to their original investment plan and not panic. Interest rate movements result in marked-tomarket (MTM) losses for fixed income funds. They also lead to MTM losses in investors’ fixed deposit portfolios, but are not felt as acutely because it doesn’t happen on a daily basis as in the case of funds. Interest rates are cyclical, so if you have a 3-5-year time period, stick with the cycle and your portfolio will deliver. Usually, interest rates are range-bound— in 1997, the 10-year yield was 11-12%, in 2001, it was 6-7%, and today we are back at 7-8%. So one could actually play the cycle by trading—get out when rates go down and enter when rates go up. Regarding equities, at one point the index was at 4,000, but now it is at 16,000 (up four times), while 25 years ago it was at 1,000 (up 16 times). One must remain invested in equities; as you extend your time horizon, the exit point will be sufficiently higher than your entry point. Should retail investors invest in commodities? Commodities are fairly volatile as there are too many variables for determining the price—demand and supply, geographical and political tensions, financial speculation, etc. Usually, a call on commodities goes wrong because a variable spins out of control and your predictions go for a toss. The earnings of these companies are so dependent on the level of prices in commodities that they have become very vulnerable. If the economy recovers and there is an expectation that commodity prices will rise, they will make bumper profits. If the economy slows, they will show huge losses. If you want to invest in commodities, do it on an experimental basis with a very small portion of your portfolio. Which strategy should retail investors follow now? I always recommend an SIP in funds. However, if someone has invested only 10% in equities and wants to take his allocation to 50%, he cannot achieve this through SIPs. In such a case, he could make a 10-15% lump-sum investment and achieve the rest through SIPs. Investors should not jump from one sector to another. Don’t focus too much on the sector that is doing well, focus instead on companies. Give companies time; even if they don’t perform over three-six months, it is fine. Over a five-year period, all sectors deliver similar returns. Investors drive looking in the rear-view mirror; what delivered good returns in the past quarter seems to be good now too. They don’t try to look at the future. They need to follow basic principles like asset allocation or buying what goes down and selling what goes up. What is your outlook on corporate earnings over the next three-five years? In the past few quarters, corporate performance has benefited from high liquidity, falling interest rates, falling inflation, margins being supported by lower cost of raw materials and higher volumes. The government’s fiscal stimulus plan is also continuing. Going forward, we will see some reversal—inflation will start moving up, liquidity will come down, interest rates may start rising from March 2010, margins will bear the burden of high raw material cost, high interest rates and low liquidity. If the government and entrepreneurs deliver, a nominal corporate earnings growth of 15-20% is achievable. Infrastructure is likely to see a lot of investment as there is a demand and the valuations of many infrastructure stocks have not moved up as much as the broad market. The capital cycle will start moving again as investors start investing, entrepreneurs start projects and the government facilitates them. Consumption is another sector that should do well; more than a billion consumers are likely to spend money and create opportunities. I practice what I preach. I put my money in mutual funds and properties based on my asset allocation. When did you start investing? I started when I was in college. We were like rats driven by Harshad Mehta’s piper—we followed him all the way down to the sea and lost our money. It was a great lesson. I lost a large sum, but luckily it was only a small portion of my family’s net worth, and that saved the day. When you lose in your first attempt, it remains with you for life. You realise money doesn’t come easily. Which luxuries and hobbies do you like to spend on? I am a value-for-money man. For me, luxury is reading books and spending time with my kids. I hate travelling and any location outside Mumbai is nice considering it’s a good change from the fast-paced life. Who are the market gurus you look up to? They are giants with the ability to look into the future much before us—Warren Buffett, Bill Cross, the Fed governors and regulators and investors like Bill Millers. There is a lot to learn from their views and experiences. Which book would you like to recommend to our readers? Dandho Investor by Mohnish Pabrai. It explains how you should invest in a simple and lucid manner.